Now it's my turn to take over the blog.. I made a very simple card showcasing the gorgeous papers available at Lulupu... Doing my first tutorial so please be kind and gentle.. 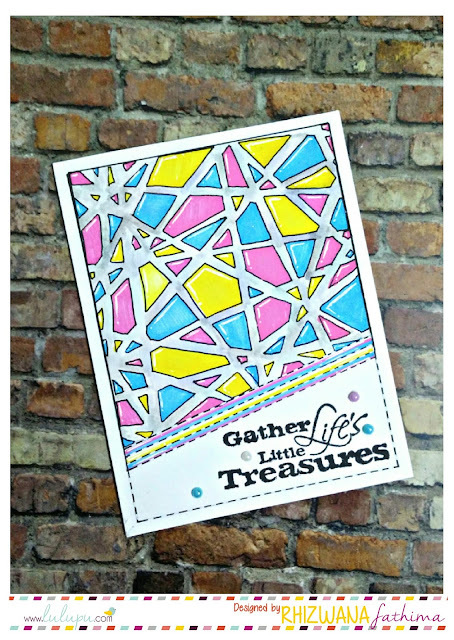 I have done something which is called the starburst technique and I find it one of the best techniques to show off your patterned paper.. So this is a must do for a PP loving people (including me).. So to start off you need a 4" by 5.25" card-stock for your base and three to four pieces of coordinating patterned paper cut to size 1.5" by 4.5"
Now you have to cut each patterned paper diagonally so that you get 6/8 pieces of the patterned paper. Now it's time to arrange your patterned paper over your base card-stock.. make sure you roughly align your papers before sticking them so that you can get the feel of the basic outline of your layout.. While adhering the patterned paper onto the card-stock.. do not glue the tips and the edges.. just put some glue to the center of the patterned paper and arrange it in the way shown in the picture below.. This is how the card-stock would look once your have stuck all the patterned papers.. Patterned Paper:-Fashion District Custom Value Pack Pad 12"x12"
Hope you liked the tutorial.. Do drop your comments and queries and will get back to ASAP!! this is abs fab Khushboo... love the beautiful burst of colors on the card and the way u blended them together is super...!!! That's a gr8 card is really simple too!! Thanks for sharing!! This is very lovely Khushboo...i love the Pp you have used and the burst of colors looks so amazing..in fact i had seen an sunburst card of your some time ago and always wanted to know how you did it...thank you so much for the tutorial.. will try to give this a go:). This is real cool! Loved the way you have put it all together in a simple yet elegant way! Gorgeous work Khushboo! Super super super!! I love the papers and the tutorial is fabulous!! Great job girl! Thank you for the tutorial. gotta try this!! Awesome and neat technique-- appeals to the frugal crafter in me! FREE Shipping Offer! Happy Women's Day & Holi!